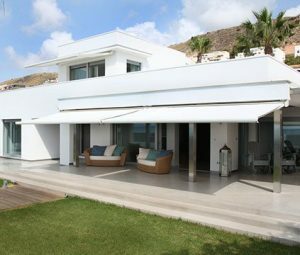 Retractable awnings are a great addition to many residential and commercial spaces. Not only do they aesthetically enhance your outdoor decor, they offer many functional benefits as well. Awnings block the sun, but not your view. As much as we love Miami for its “summer year-round” vibes, sometimes the sun can be a bit much for some to handle. Causing them to spend more time indoors. Installing a retractable awning creates a nice shaded oasis, allowing you to relax outside, take in the views, and enjoy the fresh air without the sun blazing down on you. With the shading a retractable awning provides, not only will it create a nice cool resting area outside, but it can help keep your indoor temperature cool as well, saving you money on your energy bills. This is because when open, your retractable awning can block out excess sunlight and lower the amount of solar heat gain in the home. 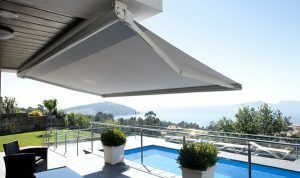 Retractable Awnings can extend you space. A retractable awning extends the comfort of your home to your outdoor space by providing a bit of shelter overhead allowing you to create a space that can be used by all of the family whether it is for playing, relaxing or dining. Once fitted, awnings are simple to operate. You can choose to have either a manual or motorized awning. With a manual awning, you simply wind a crank arm to extend or retract the awning. 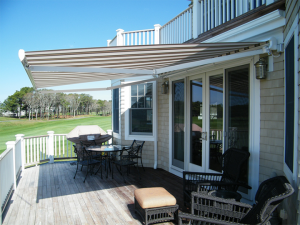 With a motorized retractable awning, you can control it position with a simple push of a button. Whether you want more shade from the sun, to extend your indoor space, gain protection from rain and sun, or just to add something nice to your outdoor décor, we have a solution for you. Contact us today to learn more and schedule your free consultation.